This model is no longer available. (As of 12/1/2018). Check out our latest review article to find the best electric skateboards of 2018! 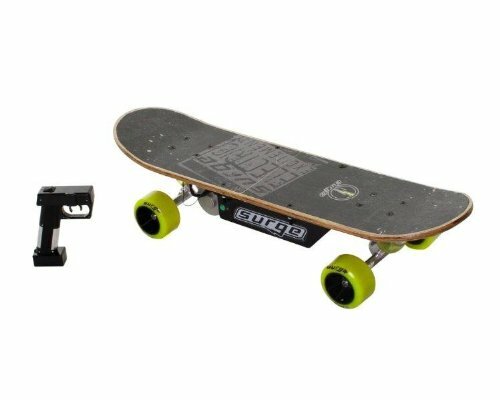 Anybody who has seen the nineties movie Back to the Future will be looking with interest at the latest generation of motorized skateboards. Granted, these boards won’t hover but, for personal transport, you can’t beat the looks of cruising around on an electric powered skateboard. They’re Eco-friendly, unlike motorized scooters, running on a lithium ion battery that is easily charged at home. The Dynacraft Surge is built for younger riders, focusing on safety, balance and comfort rather than higher speeds. Perfect for an inexperienced rider like me. Having given it a test drive on all kinds of surfaces I’m here to give you the down-low on what’s good, what’s bad and what’s ugly about the Dynacraft Surge Electric powered Skateboard. The first thing I want to mention is the looks. The Dynacraft sports a classic neon green and black color-scheme. Aside from the colors the Dynacraft has a classic skateboard shape rather than the skinnier long-board look. The wider base makes this easier to ride, helping you to balance a little better than on thinner electric skateboards. I would say that the Dynacraft Surge is a great option for younger riders because of it’s wider base. Once I had got use to the remote control, which controls speed and braking, I have to admit I was a little disappointed with the overall speed. The Dynacraft Surge gets up to a breezing six miles per hour which was great at first. When I developed a bit more confidence though it felt a bit limited. Having said that, with an age range of 8+ the Dynacraft Surge is designed for kids, so the limited speed undoubtedly doubles up as a clever safety feature. The Dynacraft Surge comes with two batteries included that can be recharged at home. For that, you get 45 minutes of run time. The 12 hour charge is a little bit of a hassle, but it’s easy to plug it in overnight, ready for a cruise in the morning. A 24V battery powers this thing which delivers a decent speed and doesn’t fade as the battery runs down. The board is enhanced with a metal alloy frame. Metal alloys provide the best of both steel and aluminum, combining the strength of steel with the light nature of aluminum. One of the real strengths of the Dynacraft Surge is it’s suitable for kids. The guys at Dynacraft have put a lot of thought into making this a safe skateboard. From the limited speed to the wider base for better balancing. This electric skateboard is a good introduction to electric skateboards for kids and younger riders. With alloy construction materials and a solid wooden deck, this electric skateboard feels sturdy. The looks are sleek with black and neon green. Plus the wider wheels can handle rougher terrains without too much issue. A few people have reported issues with the Dynacraft motor. I would have to say, so long as you follow the instructions properly you won’t have any problems with this board. That means charging it for the full eighteen hours before the first use. The speeds are a little limited which is perfect for younger riders but can feel a bit slow once you’ve got used to it. There is a long charge time and a short battery life. For the longer battery life you need to look at a higher price range. For the price, the Dynacraft Surge is an excellent performer. I'd like to wrap things up by saying the Dynacraft Surge is a subpar entry level board for beginners and is really only suited for young children. Those who are serious about electric boarding might want to look at a more expensive board with a bit more range and speed that will allow them to grow with their board & experience level. Need more information? Check out the owners manual.